For a classic Christmas roast, all we've added to this richly flavoured turkey is a little sea salt, black pepper and lemon, onion and bay leaves. Preheat the oven to 190°C, gas mark 5. Remove the giblets from the turkey. Season inside the turkey with a little sea salt and plenty of freshly ground black pepper. Finely grate the zest of the lemon and reserve, then cut the lemon into quarters lengthways. Tear the bay leaves in half and place these, with the lemon and onion quarters, inside the turkey's main cavity. This will add flavour while the bird is roasting. Transfer the turkey to a large roasting tin, breast-side up. Brush generously with the melted butter and season the skin with sea salt, freshly ground black pepper and the lemon zest. Place a square of foil loosely over the turkey to protect the breast and legs. Roast, in the preheated oven, for the calculated cooking time, basting with the juices every hour. About 30-40 minutes before the end of the cooking time, remove the foil then return the turkey to the oven. Check it is thoroughly cooked by inserting a skewer into the thickest parts of the breast and thighs: the juices should run clear and here should be no pink meat. If the juices are still pink, return to the oven for a further 15 minutes, then test again. 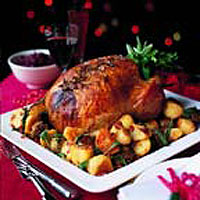 Transfer the cooked turkey to a warmed serving dish, cover tightly with buttered foil and keep warm. Allow to rest in a warm place for at least 30 minutes (it will stay hot for up to an hour if tightly wrapped in foil). Resting the turkey will allow the meat to relax and become firm, making it easier to carve and the meat more succulent. Serve with roast potatoes, vegetables and all the trimmings. To stuff the bird, stuff the neck cavity, rather than the larger main cavity, to ensure that both the stuffing and the turkey cook properly and stay moist. Calculate the cooking time allowing 20 minutes per 500g (including stuffing). To keep the stuffing from spilling out, pull the skin back over the neck and, using a cocktail stick, secure the skin flap underneath the bird. After Step 1, make a quick herb and lemon butter to go under the turkey skin. Combine 100g softened butter with a 10g pack fresh lemon thyme, chopped, a 20g pack fresh flat-leaf parsley, chopped, and the finely grated zest of 1 lemon. Lift the skin from the neck of the turkey and use your fingers to make a pocket separating the skin from the breast meat. Push the butter evenly underneath the skin to coat the meat, then smooth the skin back down and continue with Step 2. Make a herb, lemon and rose-harissa butter and use as above. Combine 100g softened butter with a 10g pack fresh lemon thyme, chopped, a 20g pack fresh flat-leaf parsley, chopped, the finely chopped peel of 3 Belazu Pickled Lemons, and 1 tablespoon Belazu Rose Harissa.